Juicing with celery may be the latest trend but the concept of juicing fruits and vegetables for better health has been around for years. 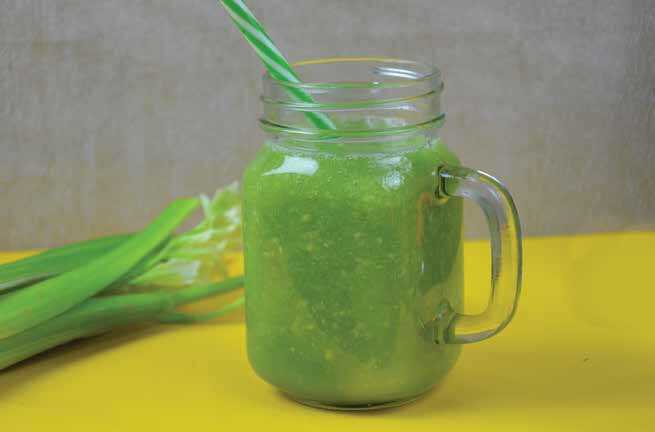 Juicing extracts celery’s most vital nutrients. You may miss out on some of the fiber, which can help with weight loss and regularity, but you’ll receive a powerful tonic in return. You can always munch on a stalk or two later in the day. Nutritionists recommend juicing your celery first thing in the morning to improve digestion throughout the day. Studies have shown celery may lower blood pressure and cholesterol, impact glucose and insulin levels, and increase enzyme activity to boost digestion. Celery also contains antioxidants and phytonutrients called flavonoids that help fight disease. It is loaded with vitamins B2, B6, C, and K; folate; potassium; calcium; and more to help ward off liver disease and cancer, improve cardiovascular health, and lower inflammation. Celery also contains coumarin compounds that enhance white blood cells and support the body’s vascular system. Celery helps purify the blood, relax the nerves, and even clear up skin problems. Rich in magnesium, organic sodium, iron, and vitamin A, it also nourishes the blood and helps remove calcium deposits. Not bad for a common vegetable. Many today suffer from low stomach acid, especially those with thyroid problems. The natural sodium in celery helps increase stomach acid to break down food more efficiently. Sluggish digestion makes one feel more fatigued, so juicing with celery should improve energy levels and reduce bloating. Since it helps break down amino acids, it also assists with protein assimilation, which can lead to a sharper mind. Food cravings are often the body’s reaction to insufficient minerals. Since celery juicing helps you process nutrients better, you’ll have fewer cravings. Celery salts also help eliminate heavy metals and toxins from the liver. Plus, they’re antifungal and antibacterial. All in all, celery is a healthy tonic for body and mind. Let’s drink to that!